Early on March 13, 1993 an unusually severe extra-tropical low moved ashore from the Gulf of Mexico hitting western Florida with hurricane force winds and a hurricane like tidal surge of up to 12 feet. Along Florida’s Gulf Coast this storm is remembered as the “No-Name Storm”. Elsewhere this intense storm is known as the “1993 SUPERSTORM”, “White Hurricane” and “The Blizzard of 1993”. The system began on March 12th and blasted the East Coast through March 15th with heavy snow, hurricane force wind gusts and record low barometric pressures. The storm developed as a 1002mb low on March 12th off of Brownsville, TX and tracked east to northeast deepening very rapidly while still over the north-central Gulf of Mexico dropping to 984mb just south of the Mississippi Delta and making landfall along the Florida Pan-handle during the early morning hours of March 13th as an intense storm low with a minimum pressure of around 975mb. Hurricane-strength winds and a tidal surge as high as 12 feet were reported along the Florida Gulf Coast damaging or destroying 18,000 homes and causing more than $500-million in property damage. 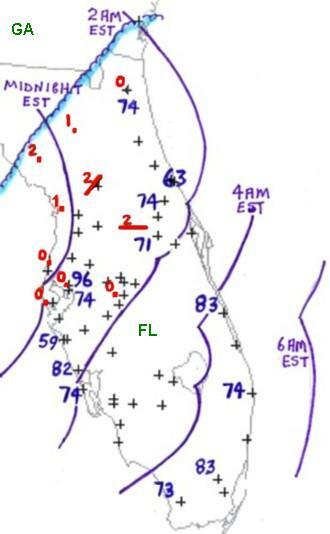 The associated strong cold front then swept across Florida and Cuba producing an intense squall line. The squall line produced a serial Derecho (pronounced "deh-RAY-cho" - a widespread and long lived windstorm that is associated with a band of rapidly moving showers or thunderstorms) as it swept across the Florida, Cuba, and adjacent waters producing hurricane force wind gusts and several tornados. Sea conditions over the eastern Gulf of Mexico were incredible causing the sinking of the 200-ft. freighter Fantastico some 70 miles off Ft. Myers killing 7 crewmembers. Ten miles from Key West, the 147-ft. freighter Miss Beholding ran aground on a coral reef and several charter fishing vessels and sailboats sank. The storm continued to strengthen as it turned north-north eastward becoming the most powerful storm to affect the continental US since the blizzard of 1888. The storm brought high winds, tornadoes, record cold temperatures, coastal flooding, and heavy precipitation including blizzard conditions as far south as northern Georgia and Alabama. Heavy snow in Atlanta forced officials closed the airport, stranding 3,000 people while snow drifts of over 20ft were reported in Boone, N.C and 4.5 ft. of snow fell in Mount LeConte, TN. In the North Atlantic, the 586-ft. freighter Gold Bond Conveyor 200 miles south of Nova Scotia reported that 90-mph winds and 100-ft. waves were battering the ship, and it was beginning to list. Later the ship was hit by a huge swell and went down with the loss of 29 crewmembers. At the time of this storm I was living in Lodi, NJ and recorded 12.5 inches of snow and ice during the 13th. Heavy snow fell during the morning of the 13th becoming mixed with sleet and freezing rain and later changing to rain as temperatures climbed to 36 degrees. As the trailing cold front moved through New Jersey, early on the 14th , light snow and snow showers added another ¾ of an inch of snow on top of the ice crusted snow from the day before. When I checked back through my records I also noticed that earlier the same month another intense low had moved through the area on March 4th. My records show that I estimated that the winds during the 4th had gusted to Beaufort Force 10-11 (55-73mph) with numerous trees down, power outages and some minor structural damage. My records indicated that during the storm of the 13th-14th the winds were not as high. The NOAA Storm Data for the 4th stated that “A low pressure system moving northward along the Appalachians developed into a major late winter storm. The storm struck the area with howling onshore winds that drove tides upward to five feet above normal. The high winds, which gusted frequently between 50 and 60 knots, downed hundreds of trees and power lines throughout the region leaving hundreds of thousand without electricity." NOAA MARCH 12-13, 1993 DERECHO - "The Superstorm Subtropical Derecho"